Nicole, the silversmith over at Arrok, you know... the talented lady I keep bombarding you with in my Mermaid Treasure series... she posted a photo of one of these amazing hand thrown pottery mugs and my heart flip flopped in my chest. Thankfully she tagged the maker. 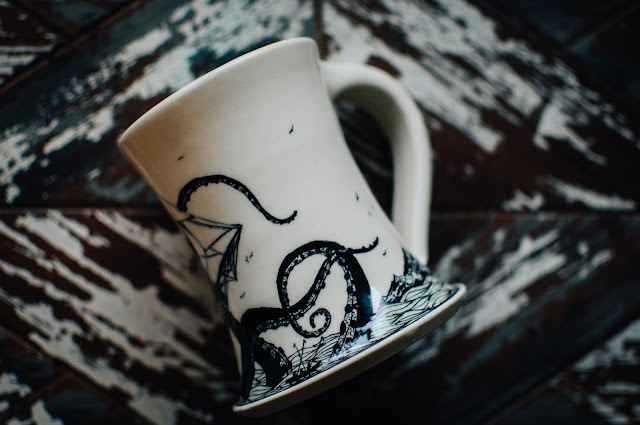 I hustled my fanny over to Scrimshaw Pottery on Etsy and purchased one lickety split. 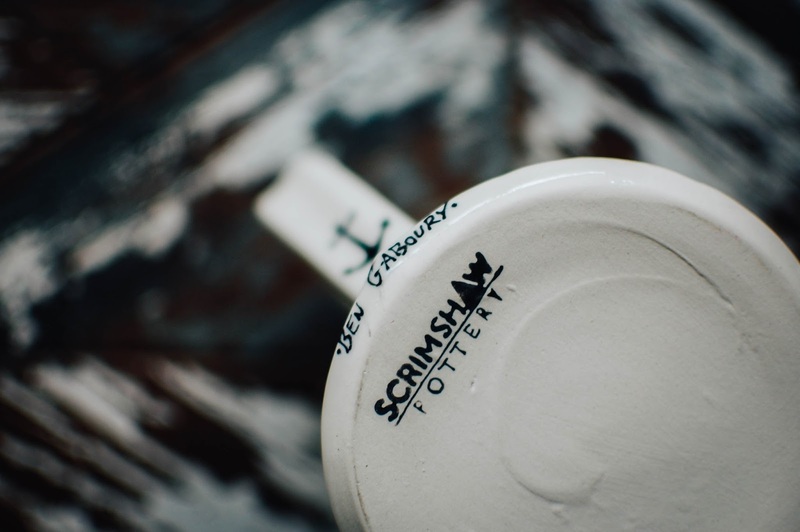 Each mug is crafted by hand from the pottery to the drawing, no stencils and no decals. How flipping amazing is that?! The sheer level of detail blows my mind and the artistry calls to me. There is an anchor at the base of the handle and each piece is signed. Check out that aqua hue. 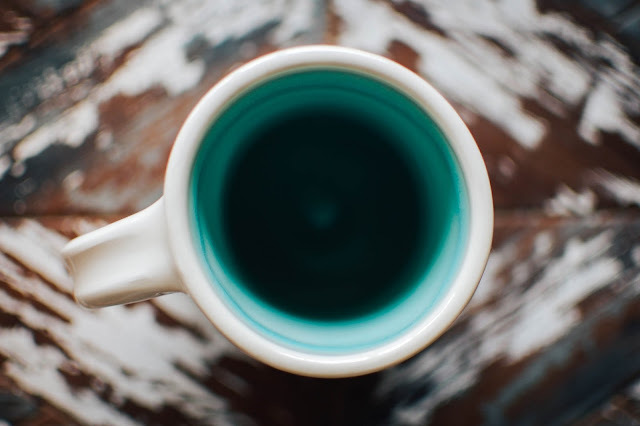 The shape of the mug lends itself to warm cradling and it holds a generous portion of coffee, about 14 ounces. Ben has a nice choice of offerings in his store almost all the time, so no hassle of speed ordering. If you have any nautical nerds in your life these would make a thoughtful gift. 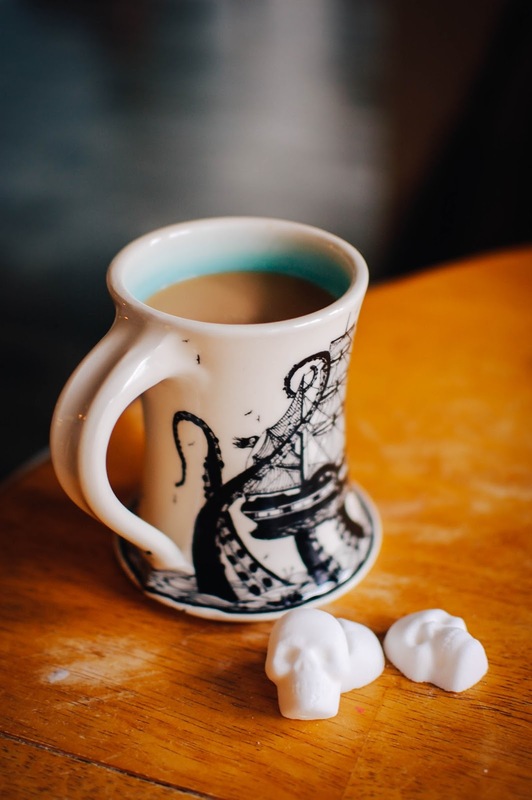 There is a gilded narwal mug I keep eyeing. The whales are pretty spectacular too. And how great do my sugar skulls go with the wee Jolly Roger flag? I may need one more in order to make a proper set of two. Are you thinking of holiday shopping yet? I have been so bad this year. Normally I am almost done by now but life keeps knocking me back a few steps. 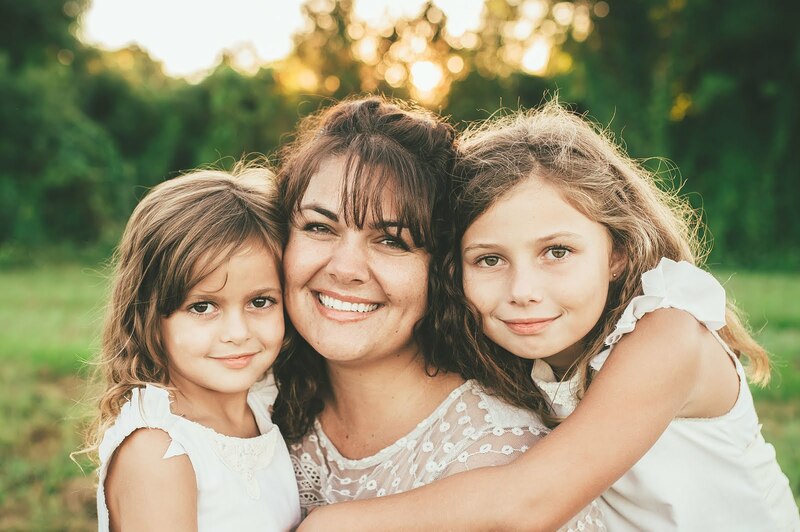 I have one gift for one of my sisters and one gift for the girls and that is it. I need to catch up. I will take a peek at this shop. I have not started shopping for the holidays but have a short list to shop for. I enjoy my octopi friends as well. They are such cool creatures. Ben has some really cool mugs and items. I see he does custom platters too. After I get back from my trip this weekend I am really going to put the peddle down and get some shopping done. My goal is to mostly gift handmade/small business items this year. The girls and Adam being the biggest exceptions. 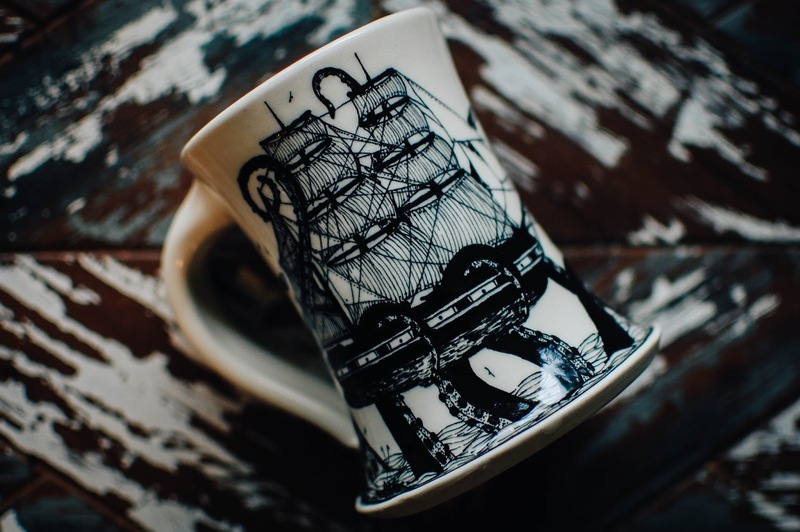 Your mug is very Pirates (see, told you it was all about me!) Actually, come to think of it, the ride could use more Kraken, like this mug! YES! It is very Pirates isn't it?! I love that ride. The smell, the darkness, the cold atmosphere (because it is usually 90 degrees outside). It is like It's A Small World... no matter how out of date it is I love it. Part of the charm. The ride in the EPCOT ball is like that for me too.